For this service the altar is placed in the centre of the church. 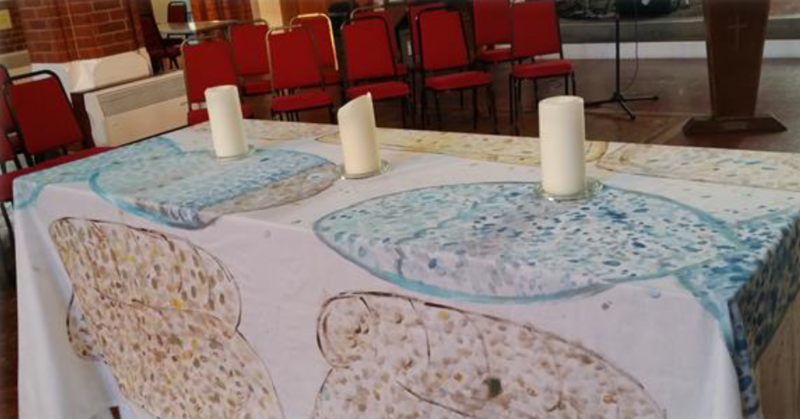 The altar cloth has been made with everyone’s fingerprints in the shape of the two fish and the five loaves of bread – a symbol of us all building Christ’s church together. centre. The All Around the Altar service is about building together a style of service that is not just “All Age or Family Service” but a fully engaged congregation that gathers in Christ’s name, enabling us to encounter and respond to Christ’s love in our lives.